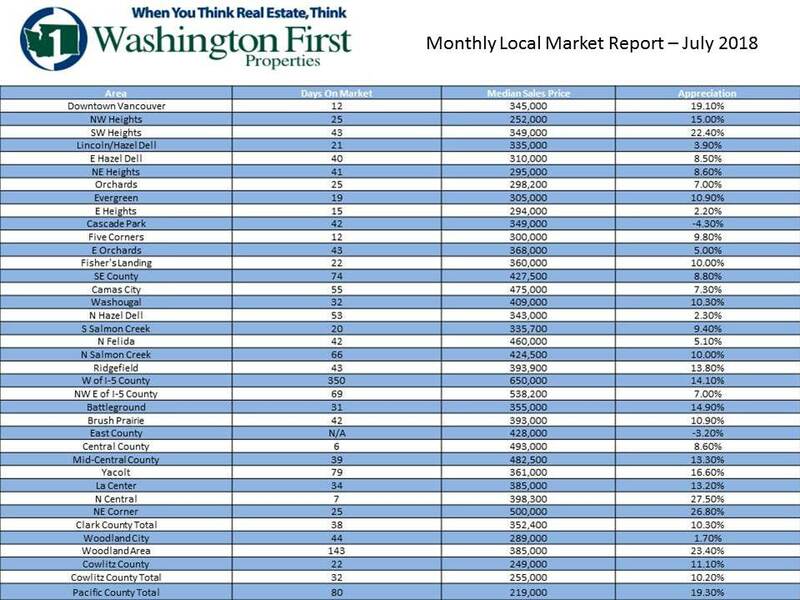 July Residential Highlights Southwest Washington again saw some mixed activity in July, but all measures continue to be ahead compared with the same period in 2017. Closed sales, at 789, ended 2.2% ahead of last year in July 2017 (772), but fell 0.9% short of the 796 closings recorded last month in June 2018. New listings fared similarly, increasing 4.2% over July 2017 (1,101) but showing a 6.9% decrease from the 1,232 new listings offered last month in June 2018. Pending sales, at 829 in July, fell 4.8% short of July 2017 (871) and 6.9% short of June 2018 (890). Inventory rose slightly to 2.3 months in July, with total market time holding steady at 38 days. Comparing the first seven months of 2018 to the same in 2017, the average sale price has risen 9.8% from $355,700 to $390,700. In the same comparison, the median sale price has risen 9.4% from $322,000 to $352,400.